"OMG! This is so good, we didn't wait for you to come back and sit down, we all ate ours already." "With these flavors, this could be a served as a breakfast dish.?" Using polenta and amaranth as the base for the GF cake gives this buttery cake an intriguing nubby-ness texture. 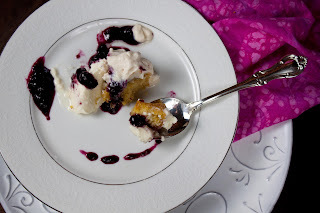 The vanilla whipping cream and the mascarpone begin to slowly melt from the heat of the warm cake and the blueberries. Just thinking about it makes me want more. The polenta amaranth cake comes together in minutes as does making homemade whipping cream. The Blueberry Compote mixture takes the longest to put together at 20 minutes, but this can be made ahead of time and simply rewarmed before serving. 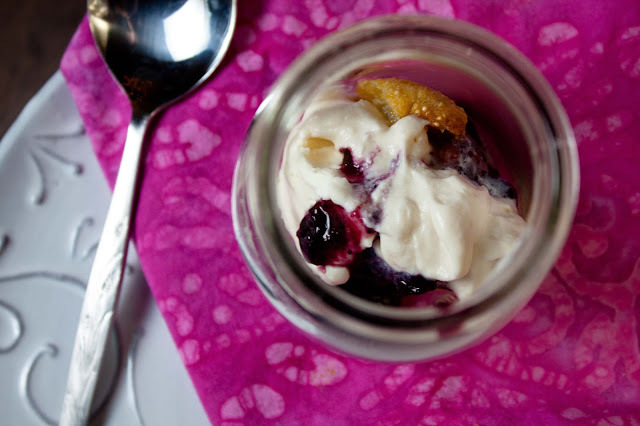 Part of the allure of this dish is the way I served it - in little glass jars. (Glass yogurt jars I emptied out in an Argentinian airport bathroom and smuggled into my luggage!) Besides being ridiculously cute, it helps to keep in the warmth of the cake and contain the melting creams. 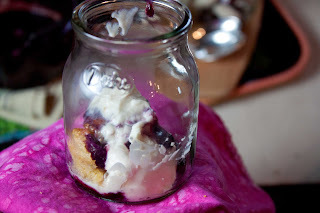 If you don't happen to have cute jars, this looks great on a plate too- see the photo below. Do serve these in small portions, too much richness can ruin the entire effect. End your next dinner party with this spectacular Fat and Happy Polenta Amaranth Cake with Mascarpone and Blueberry Compote; beware that your guest may not wait for you to return from the kitchen before they dig in. And that is a good thing. Fat and Happy Food Blog Tips and Techniques: For the cakes, I used tiny ramekins that held 2 tablespoons of batter perfectly, with room to rise slightly (they are actually glass seafood butter dishes). Use your smallest ramekin and just fill with a few tablespoons. Don't worry about the cakes holding their shape when they come out because you can break it apart and cover it with all the creamy toppings in the serving jars. Yield: 10 mini cakes. Begin with the blueberry compote: Add all the ingredients to a small saucepan, simmer for about 15 minutes or until desired texture is reached. Keep warm until ready to use. Cook the cakes: Grease the ramekins and preheat the toaster oven to 375 degrees. Bring the water, sugar and vanilla to boil. Add in the amaranth and polenta. Cook over medium heat for 5 minutes, stirring often. Remove from heat. Stir in the butter. Whisk the egg in a separate bowl, then add to the batter. Pour the cake batter into the prepared ramekins. Bake 10-15 minutes for until the cakes begin to just brown on top. Use a thin knife to lightly loosen edges as needed. Whip the Cream: use a hand held or small immersion blender to whip the cream with the sugar until soft peaks form, Add in the vanilla. Putting it all Together: Work quickly so these are served while warm. Place the cake in the serving dish. Top with on table spoon scoop of mascarpone. 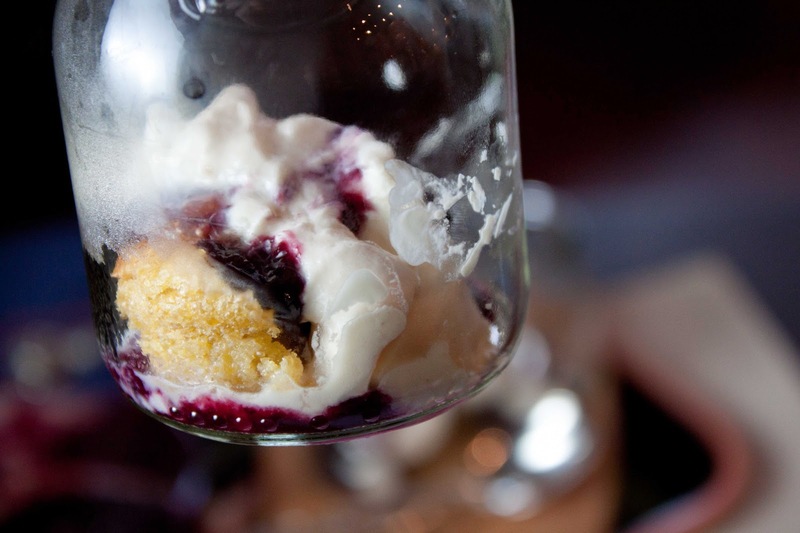 Drizzle with a spoonful of blueberry sauce. Top with a dollop of the fresh whipped cream. Enjoy immediately.